Mites are common pests in grain storages and mostly occur in damp or moist grain, residues, oilseeds and animal feeds. They are not readily seen because they are the size of specks of dust. Mites are not insects (which have six legs) but are related to ticks and spiders and have eight legs. When present in large numbers mites appear as a moving carpet of brown dust on the grain, silos and sheds or on stacks of commodities, sometimes emitting a damp or pungent smell. The mould mite Tyrophagus putrescentiae (Schrank) is the most common grain storage mite. The grain or flour mite, Acarus siro L. is also widespread and sometimes the ‘straw-itch mite’, Pymotes tritici can cause problems in storages. A predatory (and therefore, beneficial) species Chelyletus malaccensis Oudemans, is also encountered where the above species are present. Generally, 2-3 species are present in an infestation. Mould mite, or Lemon-scented mite (Tyrophagus putriscentiae). Approx. length: 0.5mm. Acknowledgement: This image has been accessed from Systematic Entomology Laboratory, Agricultural Research Service, United States Department of Agriculture. 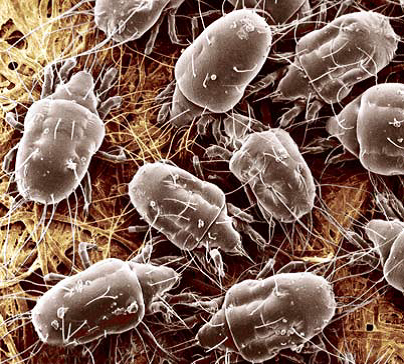 Mites multiply under high humidity conditions (over 65% relative humidity) and upper temperature limit of 35-370C. Under these conditions, the common mould mite completes its life cycle in 8-12 days and a maximum population growth of 500 times per month can occur. Because of their rapid growth in warm, moist conditions, they usually reach peak numbers during late summer. They are more common in the higher humidity of coastal regions than in drier inland areas. Infestations of mites are generally more conspicuous in commodities with high moisture content and contaminated with mould. Heavy infestation of other stored product pests often creates favourable conditions for mite outbreaks. Both the mould and grain mites cause direct damage by eating the germ of the grain and spreading fungi in the commodities. Heavily infested commodity becomes tainted with off-flavours caused by squashed mite bodies when it is moved or processed. During heavy infestation from the mould mite, the dead and live mites settle as a brownish dust layer on stacks of commodities and floors of stores and emit a lemon-flavoured odour leading to the popular name ‘Lemon-scented mite’. In this situation, they can cause discomfort to workers handling infested grain and packaged commodities. The ‘straw-itch mite’ can cause severe dermatitis and allergic conditions in people handling infested commodities. Infested feedlots are also been reported to have caused feeding problems and allergic conditions in stock. The markets reject heavily infested commodities. Remove and destroy unwanted, infested produce by burning or burying. If infested produce is to be kept, fumigate as described below. Clean up and destroy grain dust and grain residues at least weekly. Clean grain storages and handling equipment before handling new uninfested produce. Methoprene (eg, Rizacon S®, IGR®), is currently registered as a stored grain treatment for insect control and is known to be effective against these mites. Spinosad (eg Conserve Plus®), can also control these mites. Commonly used protectant insecticides that are known to be ineffective against these mites are: pyrimiphos-methyl (eg Actellic®), chlorpyrifos-methyl (eg Reldan®) and fenitrothion (numerous trade names). reducing moisture below 55% relative humidity or 12% moisture for cereal grains, for example by drying. Fumigation with phosphine will kill mites only if it is done in a sealed, gas-tight storage. Dosages lower than recommended on the label often allow mite eggs to survive during the fumigation. Reinfestation due to subsequent hatchings can then occur after the fumigation period is over. Apply 1.5 tablets per cubic metre and leave the enclosure sealed for 7 days if temperature of the produce is above 25.0C, or for 10 days at lower temperatures. Air the treated produce before it is handled. If you are in doubt about the identification of insect or mite pests in stored products, please send live specimens to Dr Manoj Nayak, Postharvest Grain Protection Team, Ecosciences Precinct, 3C West, 41 Boggo Road, Dutton Park, QLD 4102. Please be sure to include your full contact details, and details of any treatment the pests may have had.